Arizona strawberries, bullets, whistleberries, the musical fruit – a simple instant food that never quite shed school dinner associations until I decided to posh them up with fried onions and stuff. Don’t just boil your fairtrade basmati: add two cloves of chopped garlic and a fist full of frozen peas while it is bubbling on the hob. Did I Mention How Much I Love Ratatouille? This is a staple in our house. It makes excellent use of the sort of vegetables we get in our organic bag from Farmaround. My mother used to serve this as a side dish but it makes a great vegan main course, too. 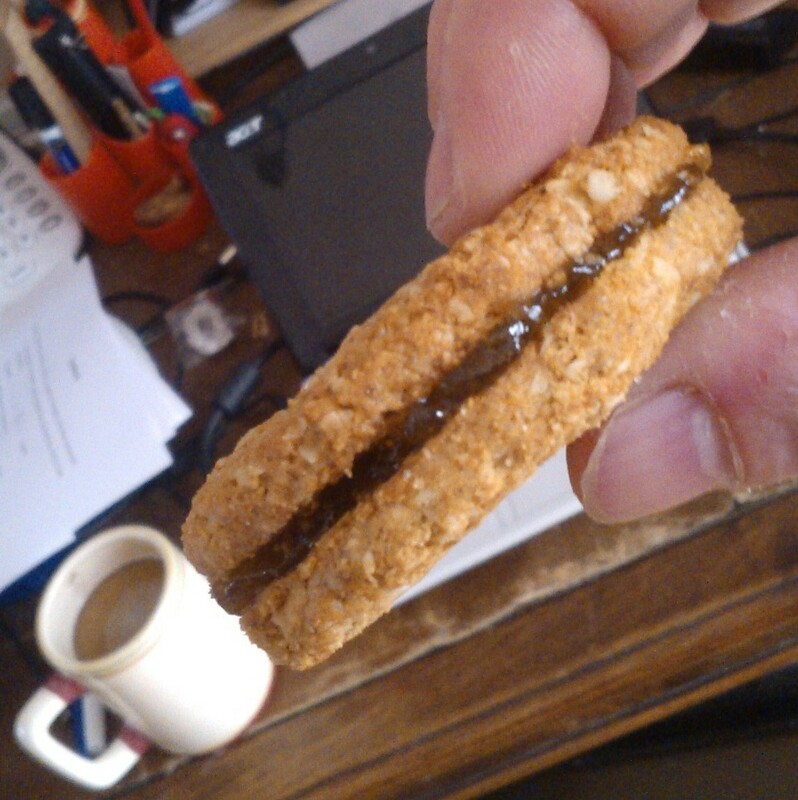 I am so fond of it that it would definitely be one of the foods I would opt for on an hypothetical “desert island”. Here’s my take on the traditional french vegetable stew. This recipe makes enough for four substantial portions. Ratatouille - cut the vegetables up chunky. Use a wide bottomed saucepan with a lid or preferably a cast iron pot or casserole. 1. Put the pan or pot on the hob on a moderate heat and add the olive oil to start heating it. 2. Begin to chop up the vegetables, adding them in the following order and stirring after each addition: Onions (cut in half and then vertically into half rings), Courgette (in semi circles), Peppers (in strips), Aubergine (in quartered or halved circles), Tomatoes (cut into segments), and finally the Garlic (finely chopped). 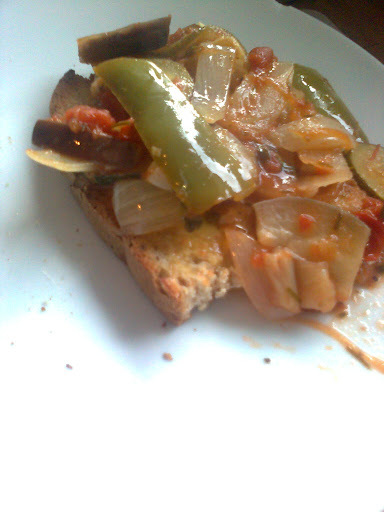 If there is any left over for another day, this is my favourite way to eat it - cold, on a chunk of toast. 3. Stir in the Worcestershire Sauce/mushroom ketchup and the dried herbs thoroughly and add ground pepper to taste – just a few twists of the grinder will do. The vegetables should have started to soften. 4. Make up one cup of vegetable stock from a single cube and pour it over the vegetables. 5. Place the lid on the pot or pan and reduce the heat to a very low gentle simmer for about half an hour. 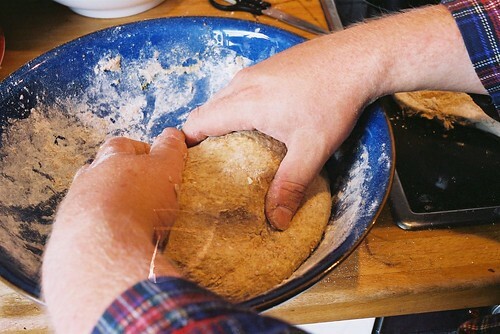 Stir once or twice during the cooking period. 6. Serve with baked potatoes or chunks of crusty bread and butter. Ratatouille improves considerably by being left to stand overnight when it can then be re-heated or eaten cold, which is absolutely delicious. 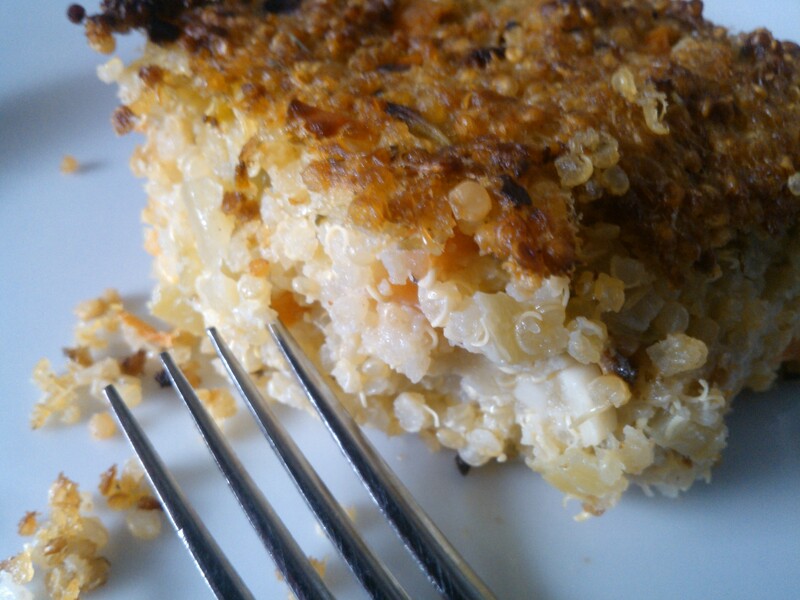 If you like this, there are more of my recipes here. Comfrey is the name of one of the very loveable main characters in William Horwood‘s “Duncton Chronicles” series of fantasy novels about moles. From an early age, these books in many ways shaped my love for the English countryside and the things that grow in it as well as the powers that lie under it. Comfrey is a very special plant. It would seem that there is nothing which tradition has not held at some point that it cannot heal. Both the roots and the leaves have been used for centuries for their reputed medicinal properties. However, if you are not an apothercary, this humble plant at least deserves a place in your next sandwich. The leaves have a distinctive flavour and make a versatile vegetable, raw or cooked. The flowers are sweet and delicious, too. For me, this plant tastes of riverbanks in the summer (which is where it is generally found) and I would often wander off to find some when out picnicking because it works so well just by itself, between two slices of bread. Yes, the uncooked leaves are hairy but this makes for an interestng texture and shouldn’t put the forager off. Delicious fritters can be made by dipping the fresh leaves (stalks and all) in a light batter and quickly frying on both sides. I think it makes a great substitute for “seaweed” in some recipes that require seaweed as it has seaweedy slipperiness about it when cooked. 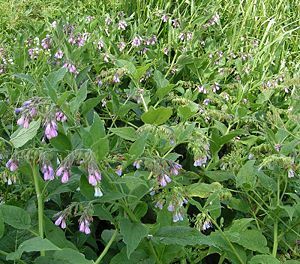 It is worth noting that Comfrey has been one of the plants at the centre of a long running debate among herbalists about the potential harmful effects of pyrrolizidine alkaloids and it should probably be avoided for caution’s sake by anyone with a liver disorder. I would encourage people to read up on it if they are concerned and to make an informed decision about eating a lot of it. To err on the side of caution, I limit to occasional use and go for younger leaves which contain lesser concentrations of. In any case, it has been eaten by humans for many more years than Big Macs have. So, it’s hairy, it goes slimy when you cook it and it may contain some pyrrolizidine alkaloids – why touch it? Because it’s yum. At least try it once. Comfrey – The Facts. Nice informative overview of the pyrrolizidine alkaloids debate from Garden Web.